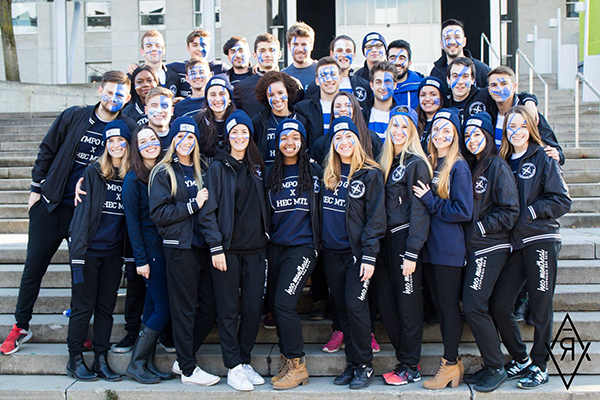 The HEC Montréal BBA delegation took 1st place overall in the Symposium GRH, held from November 18 to 20 on the Lévis campus of the Université du Québec à Rimouski. Over 270 students from eight universities faced off in this human resources management competition, the largest of its kind in Eastern Canada. The competition consists of three parts – academic, sports and participation – and the School’s students stood out in several events. For the case events, the surprise case team won 1st place, while the human resources management case team took 2nd and the grievance arbitration case team came in 3rd. The School’s students also did very well in the tchoukball sports event (2nd place) and in the quiz segment (2nd place). They also took 1st place for participation. Grievance arbitration: Sandrine Barrière, Régine Cléophat and Jean-François Prémont Corbeil. Surprise case: Sandrine Barrière, Audrey Beaudoin and Ariana Leanez. Collective agreement: Gauthier Boullet, Katrina Girard and Ariana Leanez. Human resources management: Audrey Beaudoin, Marie Hilaire and Maxandre Perron-Deschênes. Participation: Sullivan Baba, Thibault Delorme, Cassandra Fikler, Véronique Gingras, Alexandrine Pilon and Paul Turlotte. Quiz: Mabéty Desjardins, Thomas Lachance and Antoine Lapointe. Sports: Antoine Bibeau Laforce, Roxanne Cardinal, Alexandre Cervetti, Laura Corriveau, Marc-Antoine Duchesne, Hélène Joly-Meloche and Clément Wilbois. The teams were coached by Patrick Dubé, Jean-Yves Hinse, Chloé Fortin-Bergeron, France Cormier, Ariane Lussier-Thuot and Simon L'Africain. Finally, note that the delegation was supervised by Flavie Sumu and co-ordinated during the event by Adrien Thibaud.